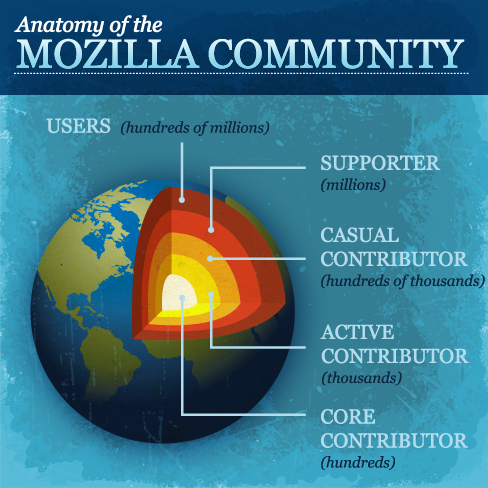 Who Is In The Mozilla Community? I got involved with Mozilla because I loved that I could just show up and start helping and would be welcomed as a valued contributor. There was no interview, no approval process and no secret handshake. This is wonderful but it does make it hard to know who is in the community*. There have been attempts before to pull together information from available sources and last year’s State of Mozilla report has an infographic that includes many of the numbers we have. I think we can build on this and improve it. For instance, with 10 layers of numbers it is hard to read and some of the numbers (eg, Bugzilla accounts) aren’t that informative. Also some data is specific to certain project areas and other important areas are omitted. It seems like a good next step would be to define a few useful categories that are general enough to cover the wide range of activities going on across the community. We could then use those definitions to more simply show the community as a whole. Here is a first pass at a new infographic that does this. Definitions for these categories and examples of each are below. What do you think of these definitions or the infographic? Does this reflect your feelings about who is in Mozilla? * I’m fascinated by what we don’t know about Mozilla and over the years have tried to fill in some of the gaps by also tracking Mozilla sites and applications that use Mozilla code. Just a suggestion: If the the categories aren’t the real name of the different layers of the earth, why don’t use a fake top layer for the planet (instead of the real map of the world)? Santiago, glad to hear you like this. I think using a different top layer is a great idea — maybe the blue globe from the Firefox icon? I thought the same thing, the only problem that I found is that we should change the color of the background because with the actual background will be difficult to see the planet. I was just going to suggest using the Firefox icon continents rather than an actual Earth map, though I could see an argument that familiar continents might make the idea behind the picture clearer to some people. Steuard, good points about the definitions. Please feel free to suggest tweaks to existing definitions or all new definitions if we’re missing things. For conversations with others, I agree that the conversations themselves aren’t the point of someone’s contributions. I put that in though since I think there are a whole class of things that people can’t do if they don’t interact with other community members. Or to put it another way — you can anonymously do many different things as a casual contributor, but you couldn’t anonymously be a community leader. Maybe it’s a distinction worth making or maybe not? That anonymous issue would also apply to time frames — we certainly could add the ‘past 12 months’ to the casual contributor definition but if most of those people are anonymous it might not be possible in practice to determine recent activity there? I like it the idea. I agree the blue firefox globe would be cool. 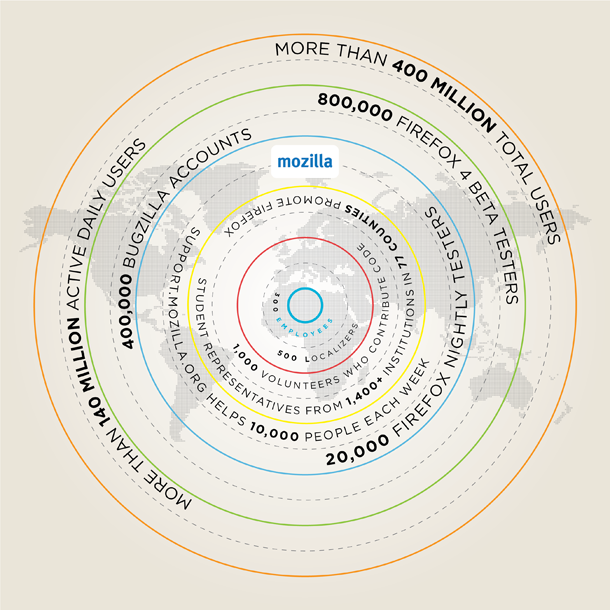 I also like the more detailed numbers in the State of Mozilla graphic. Luke, thanks for the feedback. I’m certainly not against detailed numbers, but I’d prefer to leave them out of the infographic and put them somewhere more readable. Maybe the infographic needs a link to a wiki with those detailed numbers? very cool visualization. i think the less granular categories and values help make more of an impact on people who don’t know much about mozilla. It would also be interesting to know how many people contribute to supporting others on support.mozilla.org. Agreed. Getting numbers for the different types of contributors is a good next step. I’d like to know where I fit in this hierarchy too! I help testing all Firefox’s pre releases, I help to localize the es-AR locale, I assist to all bugdays and testdays I can and help all I can in each of them. I like the the blue firefox globe idea! Gabriela, you are making significant contributions in many areas and would definitely be an active contributor or core contributor. The dividing lines between different definitions can be a bit blurry, but the key difference between active and core is if there is something you own (for instance, do you own scheduling the bugdays or own helping new people in a bugday?). David, no I don’t own anything, I just contribute all I can because I Iove helping to make the best browser ever even better! I have a couple of comments (but take it just like my personal vision on community in general). First of all, I don’t think that creating hierarchy is better. Usually people contribute from their free time and their contribution can change depends on how. There are people that are coming from other projects or just switching to other projects (now, it’s pretty common the action oriented contribution). Also, that gives me the impression of a static community. As far as I know, some people in Mozilla likes to talk about “charodic organization” and peer-driven innovation, which IMHO, means a pretty dynamic system (more a constellation than a earth). I would love to actually have a challenge on this: “making a community visualisation” and see how different people sees the community model. I think that now, Mozilla and other free culture communities are on a critical time of challenge and opportunity in regards of establishing or following a certain community model ( and indeed social and economic factors are changing a lot the way a person contributes his/her free time). So, my idea would be to try to explore more the cultural side of Mozilla communities (do we have one?) rather than creating hierarchies. Alina, thanks for the feedback. Having a design challenge around this sounds like a great idea. Maybe worth checking with the Creative Collective about this? I hear what you’re saying about an Earth model vs. a constellation model. IMO the important visual take-away here is not that there is a hierarchy but that these different groups are different sizes — it gets to the leverage of how a small group can have such a huge impact. A constellation model that shows a group of stars that are all the same size could get at other important aspects of the community, like you’re saying. And there’s certainly no reason to think that just one infographic is all we need to capture all the relevant information. So a lot of people might look at this and wonder “where do I fit in?” and I also am curious to see if we can turn the tables on that and see where people *think* they fit in perhaps in the form of allowing user tags being attached to the various levels so someone who does a lot of QA bug days might add “QA bug days” to the Active Contributor list of “What makes an Active Contributor?”. Does that make any sense? Lukas, thanks for the feedback. I definitely agree with your idea of having people say where they think they fit in. IMO, this self-identification as a Mozillian is a core part of what makes the community work like it does. When we have the phonebook, people will be able to do this by adding whatever tags they want to their profiles and we can see what emerges from what people say about themselves. I like your idea of a heatmap of the world too and this is something else that the phonebook can help with. If people add information about where they are we can put that into a visualization. I’m excited about the visualization options we’ll have — another one I’d like to do is an interactive timeline where people can say when they got involved with Mozilla and also link to videos, blog posts, etc about their story. Yes! We totally need more data about who got involved when/where and what their “aha!” moment was when they really jumped in to being a Mozilla contributor. I love this magical phonebook and in fact, as I am currently in France hanging out with the Paris Mozillians I wish more than ever for an easy way to know who is here and how I can arrange to meet them. So, someone who spends his whole day writing code or doing QA but hasn’t (yet) a “leadership position” is not a “core contributor”? Kairo, I think your example is good — we’ll know if these definitions make sense if they fit with things real Mozillians are doing. In this case, my thought is that if someone is spending their whole day coding, they likely own something (in theory we should be distributing ownership widely and it’s possible that official recognition in the module owner list, for example, just hasn’t caught up). With that having been said though, these definitions are supposed to be flexible and there might be a better way to get at things. Feel free to make suggestions for ways to tweak or rework anything here. I think Lukas’s tag idea is very good and I’d love to see it implemented! Nice work on this. It works well for the categories for the kinds of community that we have built up over the years. All of these examples involve some sort of active participation. Are these people supporters? Casual contributors? A mix? The specific answers aren’t so important. What matters is that we look as much (or more) at the community *we want to build* as we do at the one that we have. This kind of future community map is something we sorely need. Good additions, Gabriela. Definitely people to add. You examples also highlight another important thing to track: community tied to Firefox and community working beyond Firefox (and beyond software making). Mozilla’s ‘beyond Firefox’ community is growing but off radar in when we do maps like David’s. Mark and Gabriela, thanks for the additional examples. As I mentioned to Kairo, it’s very helpful having a list of things people are doing in real life and seeing how those match up with these categories. The examples in the blog post are certainly not meant to be the only ones that apply and each example you’ve both mentioned also fit. Definitely also agree that anything people are doing to support Mozilla’s mission, through Firefox or not, should be included. Wearing a shirt, making a donation or hacking on Hackasaurus — these are all contributions and are reflected in here. If the definitions are coming across as too narrow though and you feel that some sorts of contributions are being left out, please feel free to suggest edits or all new definitions to capture what’s really going on. I confess, I have a hard time to ignore that the most outer layer of the earth is actually the least thick, volume, mass. In particular as you’re showing that it’s there by giving the globe a mostly 2D surface texture. I knew it! The core contributors are Morlocks aren’t they? I think, it’s too similar to the Perl Onion that Larry Wall once presented. I think, it’s on the Second State of the Perl Onion address. Can I translate this article for Mozilla.ro? Sure. Translating this would be great. Thanks.